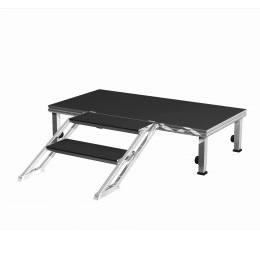 Eurotruss ED-SLR standard 48, 3x3 mm round stage deck legs. Leg height determines the height of the platform. ED-SLR-ADJ Adjustable Round Legs are telescopic legs enable seamless height adjustment from H min to H max. 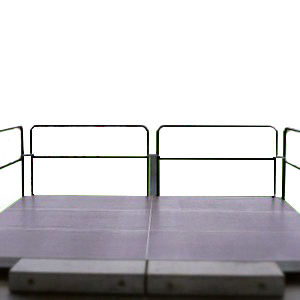 ED-SHR-SBA handrails can be used with PRO DECK . They are very durable and very light. Telescopic legs ensures a fluent regulation of the platform height in the defined range (between H min and H max). The ED-AS-SPS adjustable stairs ensure quick and smooth assembly. They are made of heavy-duty steel section and anti-slip plywood. 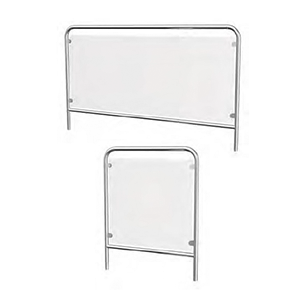 Steel handrails with glass can be used with PRO DECK. Perfect for viewing stations for the disabled people, the VIP boxes, shopping malls and trade fair construction. Modular stairs with all steps of the same height; available in 4 different heights. The stairs have adjustable feet which make it possible to place and level on uneven surfaces. SPS djustable stairs that ensure quick and smooth assembly, made of heavy-duty steel sections.